Flights, transfers and accommodation were gifted by Jet2holidays. 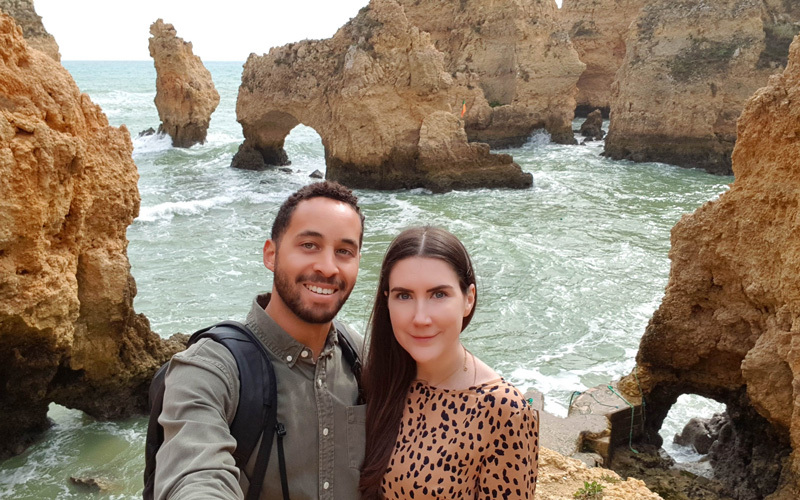 In February, Sam and I spent a few days exploring the beautiful Algarve in Portugal. 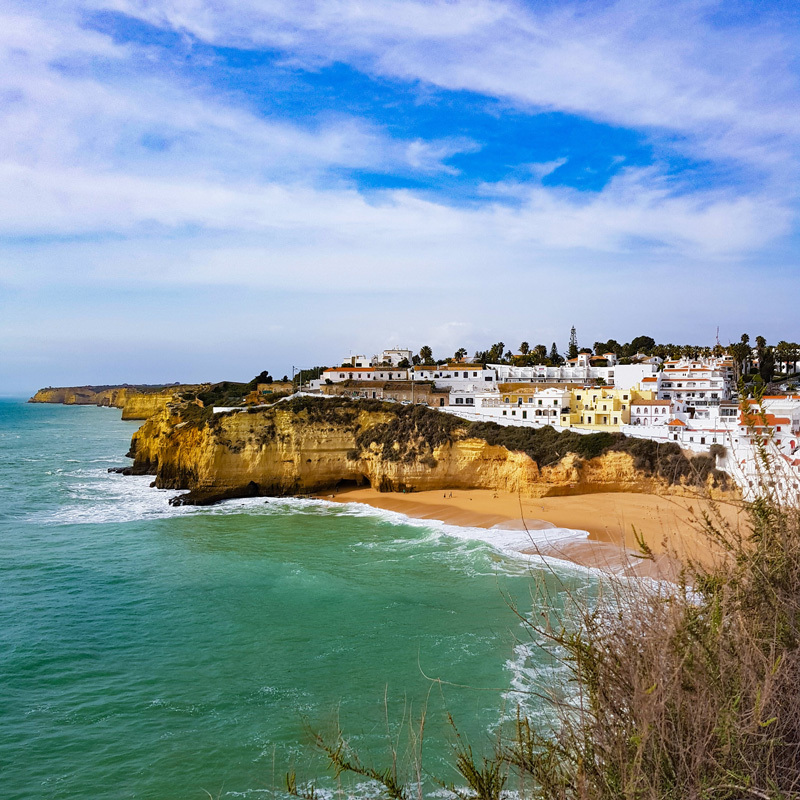 Located in the south of sunny Portugal, the Algarve is home to some of the country's most picturesque beaches, dramatic coastlines and friendliest locals. We'd never visited before but had heard wonderful things from friends so jumped at the chance to visit, with Jet2, when they offered us a complimentary trip. Likely due to last year's adventures, we've acquired a bit of a taste for luxury breaks, so we were pleased to be heading on one of Jet2's Indulgent Escapes. If you're looking for a luxury romantic getaway or just prefer hassle-free travel, I definitely recommend looking at these upmarket package holidays. When I think of traditional package holidays I picture a coachload of noisy tourists and an exhausted rep, but this couldn't be further from what we experienced. With Indulgent Escapes, you can choose from a selection of five-star hotels in prime locations which each have fantastic reviews and top-rated restaurants. We flew from Birmingham Airport, which is closer to Bristol than the bigger London airports and far more convenient. We parked in the NCP car park across from departures, walked just two minutes to the terminal and met the friendly Jet2 staff at check-in. This was our first experience flying with this airline and I was a bit surprised by how nice the staff were. Everyone was friendly, chatty and extremely helpful. They weren't faking it either, they obviously enjoyed their jobs which was lovely to see. When you book an Indulgent Escape you receive a 25kg baggage allowance per person, access to the priority security lanes and complimentary in-flight drinks. Birmingham Airport was lovely in general, it had a Bristol Airport feel about it, meaning it felt much more relaxed than the busy London airports. After a quick bite to eat, we boarded our plane to Faro, Portugal. First impressions of the plane? LEG ROOM. I'm only 5'7 but I have long legs and I always struggle when sat in the regular seats affordable airlines offer. Our seats didn't have pockets for belongings (which was a bit of a shock at first but I'm grateful) and they don't recline. Brilliant! I wish all seats were like this. The cabin crew were charming and efficient, we only had drinks on the flight out because we were full of food but the trip was easy breezy. It was just under three hours which passed quickly. Upon arrival, we were greeted by a chirpy Jet2holidays helper and directed to their office where we met two more lovely staff members who advised us our private transfer car was waiting. It was the easiest transfer ever! 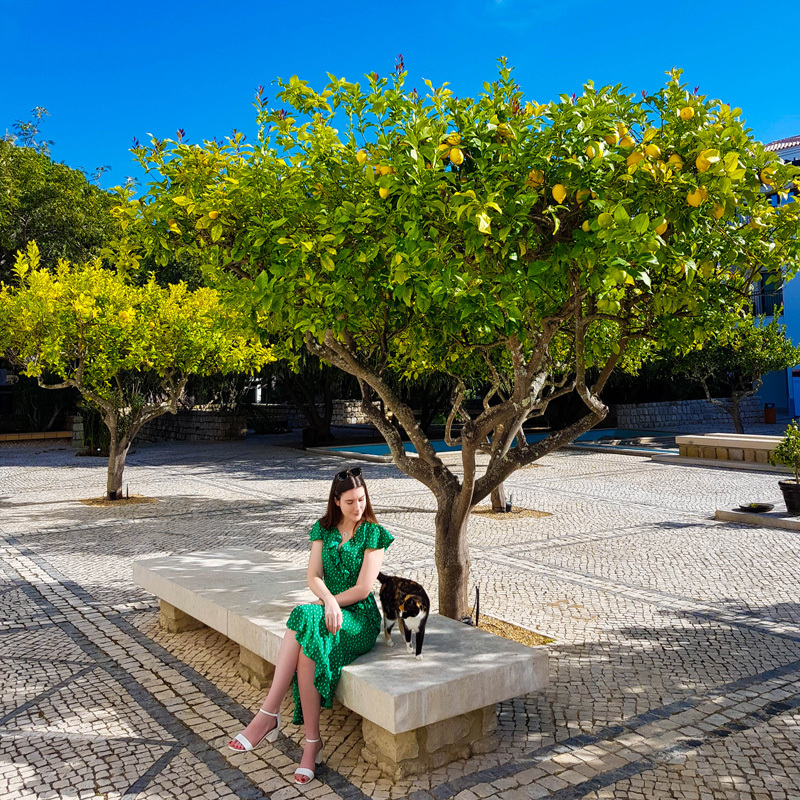 We landed early evening so it was still light and we could admire all the local citrus trees on route to our hotel, Pine Cliffs Residence a Luxury Resort in Albufeira. This transfer took just 30 minutes and saved us the hassle of arranging a taxi or Uber when we landed. When we pulled up to the resort we were really taken by the beautiful grounds. The staff went above and beyond to make us feel welcome and we were swiftly shown to our private two-bed apartment. Albufeira is the perfect base for exploring the Algarve coast. I'd seen pictures on Instagram and it reminded me of the Jurassic Coast in the UK, with its plunging cliffs and striking rock formations. As we visited in February it was off-peak which meant fewer tourists and a much more enjoyable experience in general. We couldn't believe our luck! Dorset in the UK is busy in Spring but we found the Algarve to be quiet with mostly just locals. If you don't mind warm temperatures (18°- 21°) and the breeze from the shore, visit before Easter. We rented a car so we could explore the local area in our own time—we definitely recommend this if you plan to venture outside your resort (I'll never understand people who stay by the pool the whole time). If you want to watch our adventures, you can view our Instagram stories here! 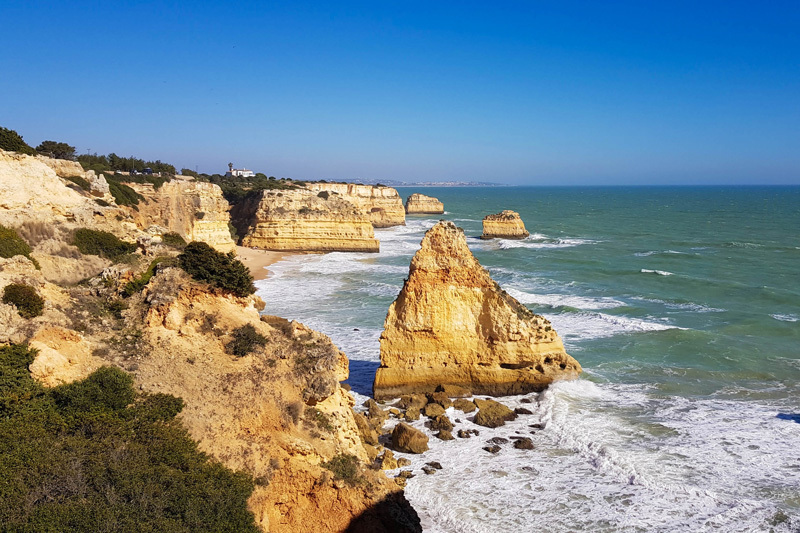 So, what are the seven reasons you should visit the Algarve? Located just a 50-minute drive from Pine Cliffs Resort is Ponta da Piedade. This was the one place I REALLY wanted to visit after seeing snaps on Instagram. Luckily for us, it was really quiet when we arrived in the morning. You need to clamber down some steep-ish steps to get to the bottom where all the action is. The water was pretty rough so I imagine it looks completely different on a calm summer's day, but it was still really beautiful. I'd recommend wearing sturdy-ish shoes because my heels weren't the wisest choice for these steps. When the water is calm, you can go on a boat trip to explore the rock formations and coastline. It was hard to imagine it peaceful so I'd love to come back again during the summer... although I imagine I'd then be jostling to get the perfect photo. 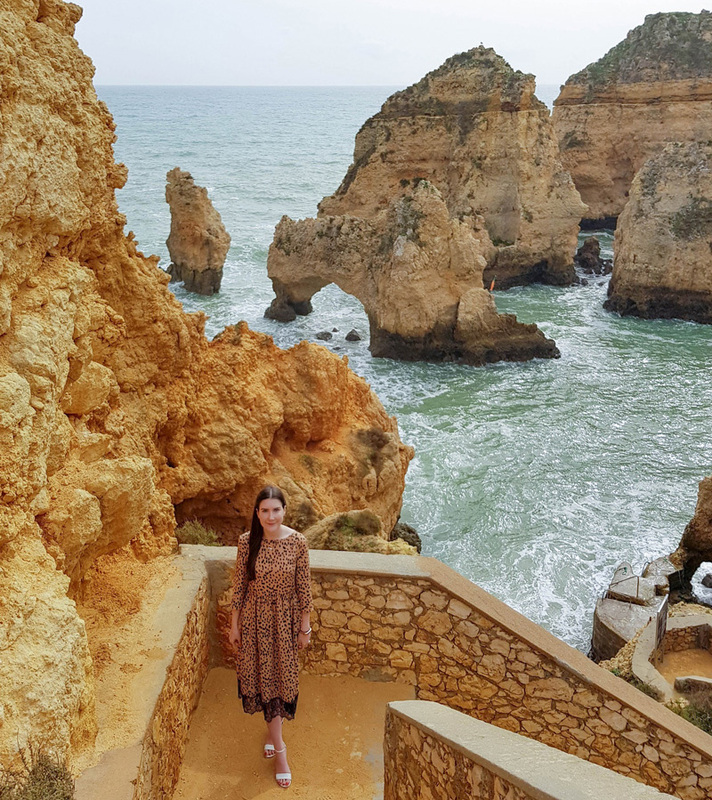 Praia do Camilo is situated within a 2-minute drive of Ponta da Piedade, so it makes sense to visit these two in the same day... Unless you're looking for that Instagram shot at destination #1 like I was. We visited Praia do Camilo on a much windier day and descended the 200 wooden steps in our knits, to keep warm! It's such a quaint beach with a cafe however this was closed when we visited. It was overcast and windy but still charming and we enjoyed posing for windswept selfies and getting wet as the tide came in. The lack of sun must've put the locals off because we had the place to ourselves. Oh yes. This was the first beach we visited and is known to be one of the most beautiful in the region. It was really warm on our first day, but there was just a handful of others visiting at the same time, which made it even more special. It's more accessible than the locations previously mentioned due to its wide steps leading from the car park down to the sand. One thing I LOVE about the Algarve is its free public parking. It costs a small fortune to park at Durdle Door, but parking here is completely free. Granted the car parks are small but when you're visiting off-peak, this really isn't much of an issue. Hello, my pretty! So getting the shot below required a bit of Googling and some luck. At first, I couldn't work out how to locate this breathtaking view but rest assured, your girl has got you. 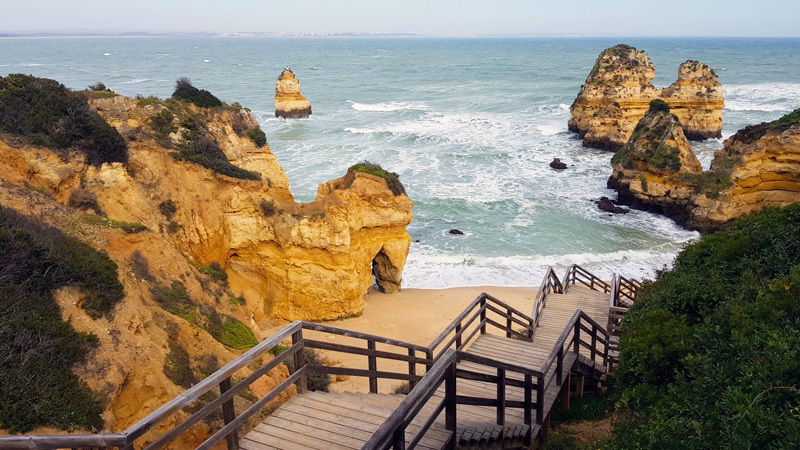 All you need to do is make your way to the Carvoeiro Boardwalk, which is really pleasant to walk along. I wish we had more cliff boardwalks in the UK. We parked a little further back (more free parking—hurrah!) but this photo was taken from the Ermida de Nossa Senhora da Encarnação also known as the Fort of Our Lady of the Incarnation. There is plenty of free parking on the street directly next to the church if you're short on time. Okay, full disclosure: due to the weather, we didn't visit the Benagil Cave but you should, if you can! To the left side of the beautiful Praia de Banagil is the Algar de Benagil. You've likely seen pictures of it before, but it's a beautiful cave with its own little beach and a sky opening known as the eye. It's a bit tricky to get to... very strong swimmers can swim or you can take a kayak, SUP or boat. We wanted to either kayak or head on a boat tour, but whether or not these trips go ahead all depends on the sea conditions. Sadly the weather was not in our favour! Boat tours book up quickly and during these trips, you often visit other caves and grottoes. If you're visiting when the water is calm, do check Benagil Cave out and let me know what it was like! This YouTube video from Roxi and Matt breaks down how awesome it is. 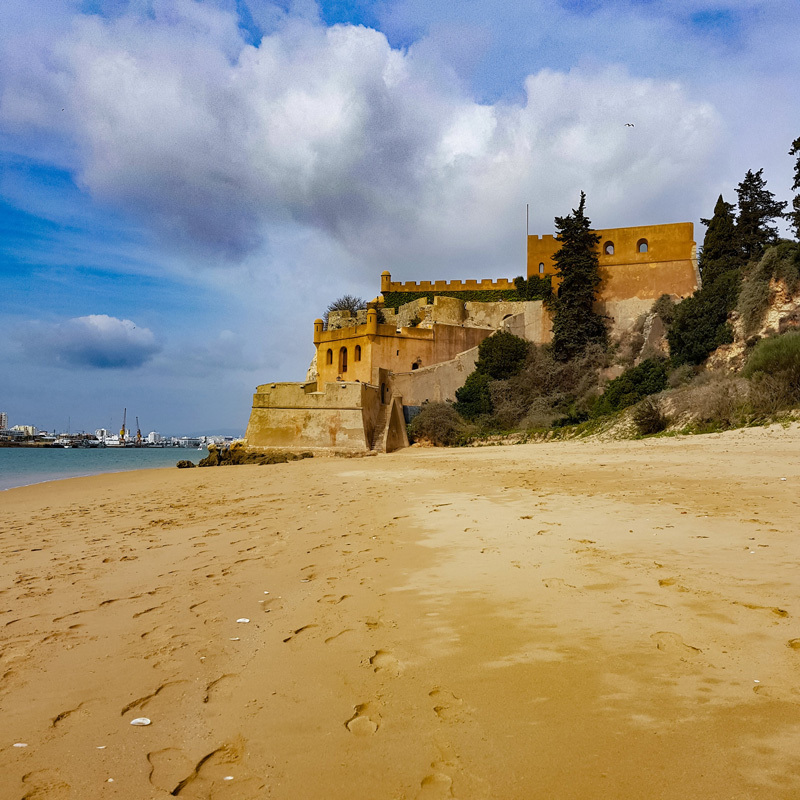 Praia da Angrinha overlooks Portimão harbour and has its very own castle, the Fort of São João do Arade! The castle reminded me a little of Tossa de Mar in Catalunya, so I'm glad we could enjoy a walk along this very quiet beach. I know I've mentioned that everywhere was quiet, but this was borderline empty. There was a little beach cafe selling fruity ciders and ice cream, which made a nice pit-stop. This would be the perfect place to bring young children if you wanted to avoid the more popular spots. Next door is Praia Grande which is a little prettier but busier. While in Ferragudo, swing by the local church on the hill which offers great views. Just opposite you'll find the sweetest little alleyways which are very colourful and quintessentially Portuguese. Oh and once again, there was free parking everywhere. Hurrah! 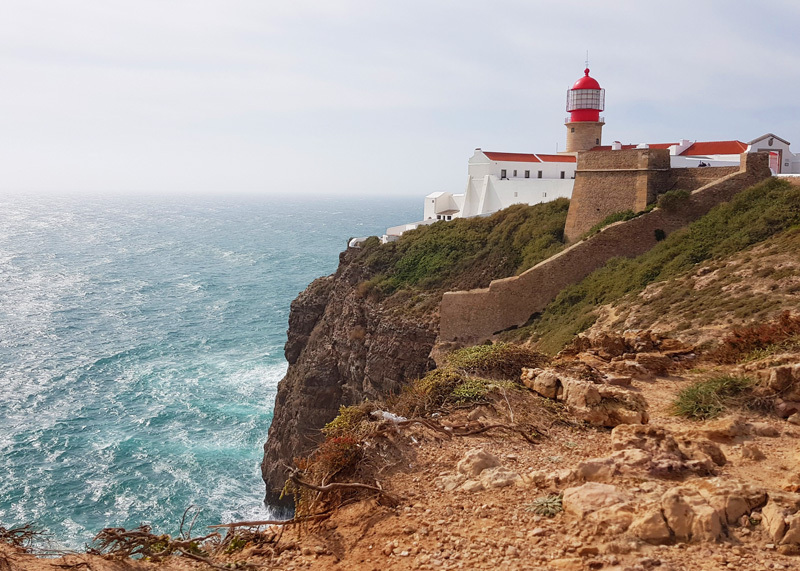 Another must-see is Cabo de São Vicente which has a charming lighthouse. Parking is again free and the views along the cape are breathtaking. We read online that you should be careful about opening your car doors due to the wind... They weren't kidding. Hold onto your door! It was extremely windy but lots of fun and we bravely (yet sensibly) took photos of our surroundings. The lighthouse itself was a bit of a let down as we couldn't get close, but apparently, it is open (along with the museum) on Wednesday afternoons. To be fair, it is supposed to be one of the brightest lighthouses! Until the end of the 14th century, it was known as the end of the world. Today, it's considered the southwesterly tip of Europe. Pretty cool. There is also a cafe there in case you fancy refuelling. 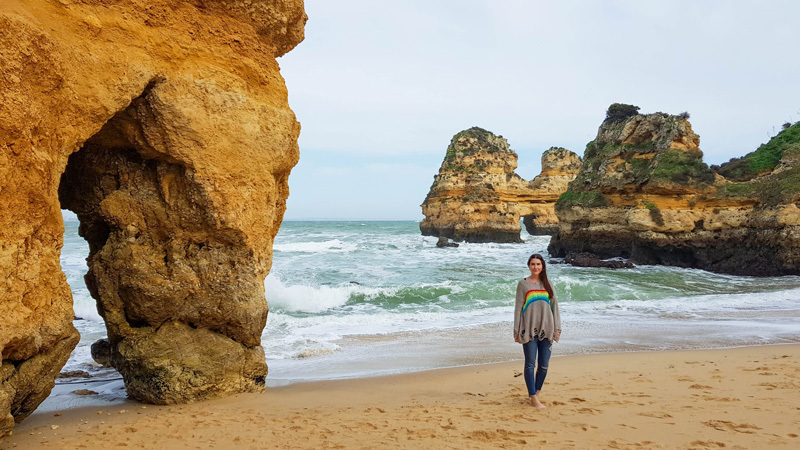 The Algarve is such a special region with so much to explore! We stayed for 4 nights and this really wasn't enough. We're definitely planning to return so we can visit more east coast locations and go inland too. How cheap is the Algarve? Pretty affordable! We did have half-board accommodation but I'd say prices were comparable to the UK. You can find very affordable eats or spend a bit more and enjoy something a little tastier. One of our favourite restaurants in Albufeira is an authentic Indian called Taste of Punjab. After we checked out of the resort on our final day, we were picked up by a very friendly airport driver and once again, had a delightful airport experience. Our flight back with Jet2 was just as comfortable as the flight out and this time we enjoyed some onboard treats. The food seemed more affordable than Easyjet and much more appetising, so gold stars all round for this airline. 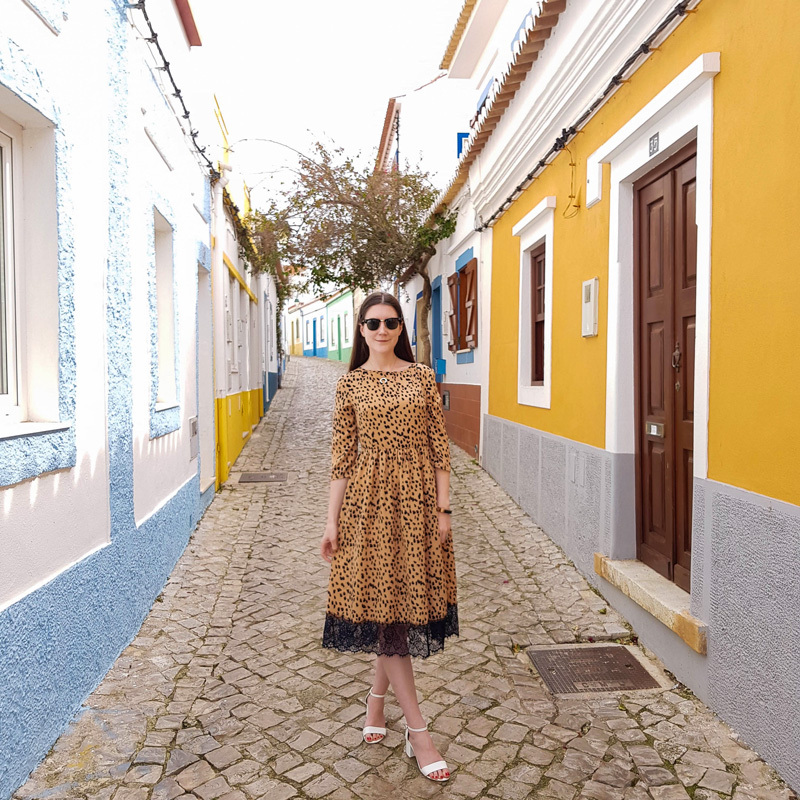 Hopefully, this post will inspire you to visit Portugal and help plan your next trip. I'm off to Lisbon in a few weeks and can't wait to devour more pastéis de nata and absorb even more Portuguese culture. You can also expect another post dedicated to Pine Cliffs Residence because there's just too much to say in one article! Thank you to Jet2holidays for sending us to Portugal to explore the beautiful Algarve. We were given complimentary flights, transfers and half-board accommodation in return for this honest review. All words are my own!